I had these 3 little baskets laying around in the garage. and added some hay and some small Easter eggs. This large galvanized bucket/tub was also in the garage. 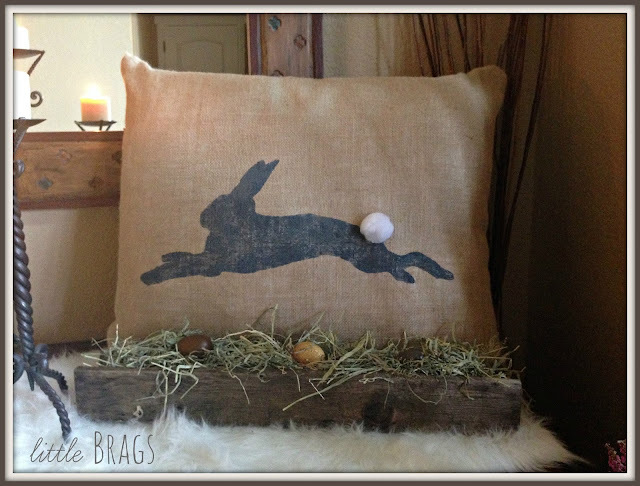 I have been stealing a lot of Bugsy's hay this year to use for Easter Decor. I believe its a type of heather plant. 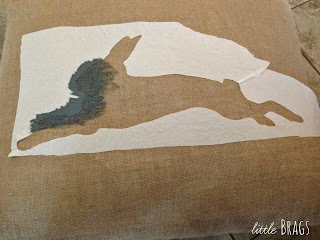 OK, as promised I will tell you how I made the bunny pillow. Well, actually I already had the giant burlap pillow. My Mom made it for me a few years ago. soooo cute! You could do that to about any pillow cover. EASY!!! instead of the fake easter grass, I think it makes all the difference. Thanks so much for visiting me and FOR PEEPS SAKE, have a Happy Easter!!!! Christine, Your pillow is adorable! I especially love the baskets on the wall! You have such a signature style! Thank you for sharing with us at Snickerdoodle Sunday! Pinned to share. I love your Easter decor. So cute! Mooi kussen heeft je moeder gemaakt. Ook makkelijk om te doen. This is a vey nicely decorated entryway Christine. 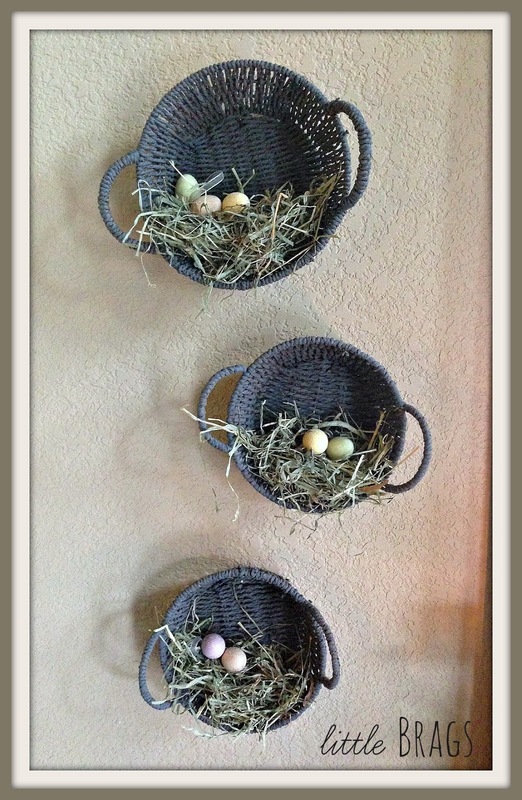 I especially love the little baskets that you hung on the wall. Have a happy Easter! wunderschön ist dein Eingang, so liebevoll und natürlich dekoriert. 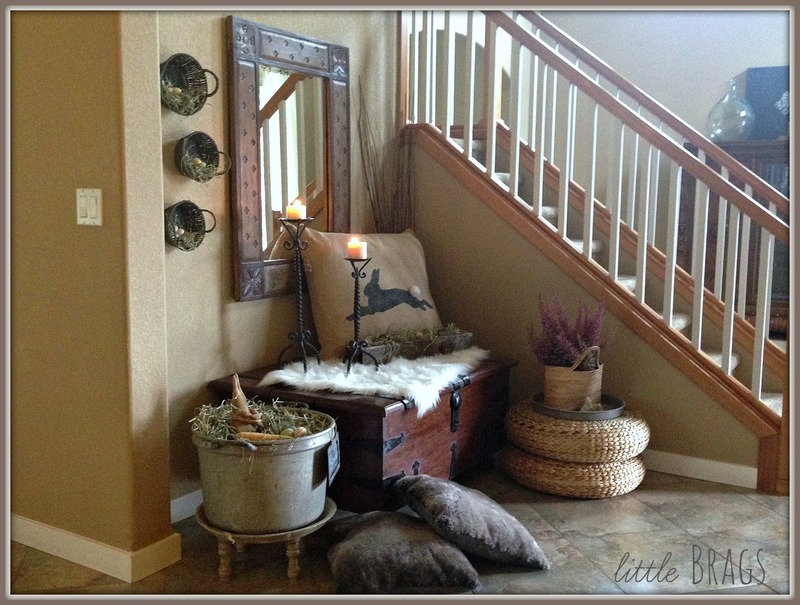 I just love your natural approach to decorating and I hope you share this with us at Celebrate Your Story Link party. Your entryway looks so cute decked out for Easter! 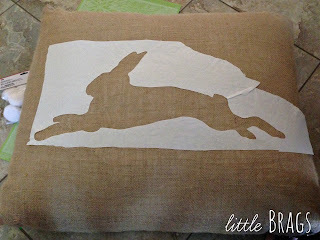 I love the burlap bunny pillow that you made. I think that your house is already decorated for Easter just by the mere fact that you have a real live bunny living at your house! 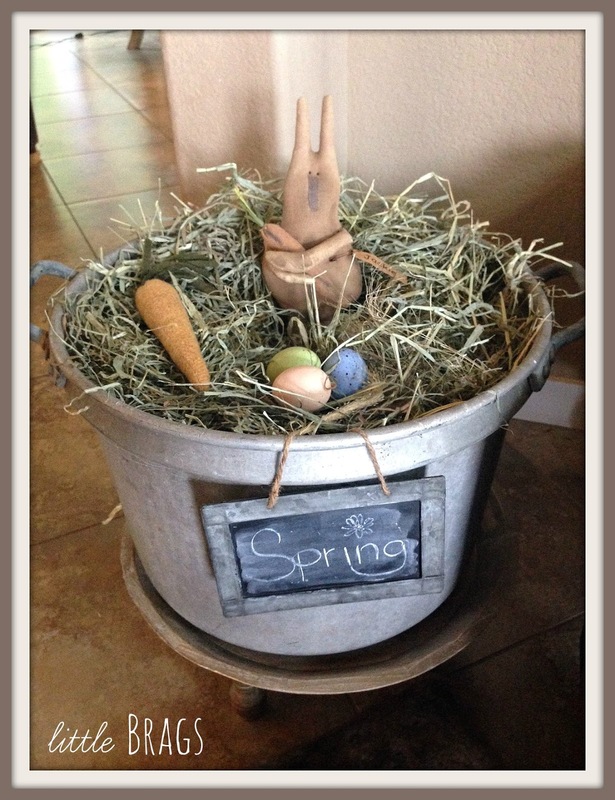 I love the way your decorated your entry for Easter Christine! Enjoy your week and weekend and have a wonderful Easter. Beautiful! 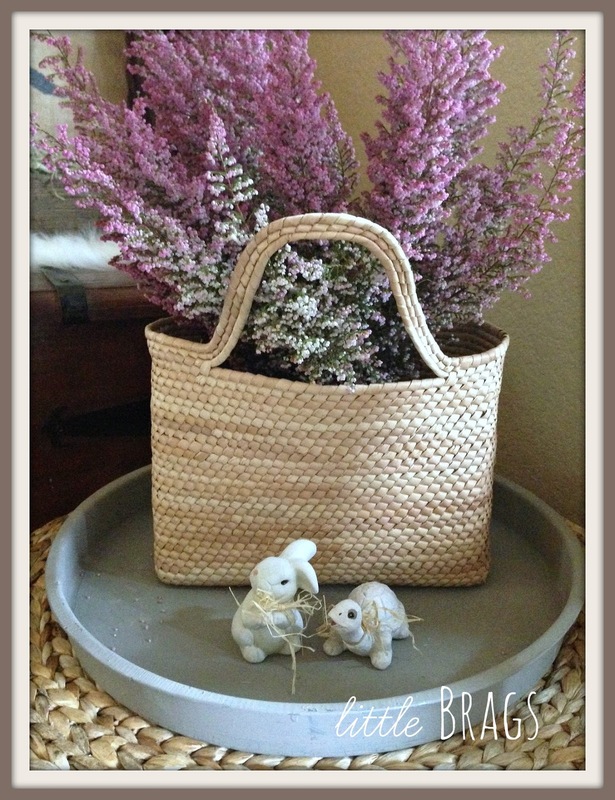 I especially like the baskets with the eggs and the basket with the heather! Love your ideas! Happy to be visiting as your neighbor at the Linkup at Back to the Basics today. I love that pillow! And the trunk. And the big fluffy blanket that just needs to be napped with. Beautiful! Popping over from Brag About It to thank you for sharing your beautiful Easter entry with us! Pinned to share! It all looks just super cute, Christine! The hay in the baskets with the eggss and the bunny (pom!) pillow are adorbs. I love the little ceramic bunny and turtle, lol! But where are the real guys?! I was so happy to see this in the link up at Celebrate Your Story,thank you! Everything looks wonderful, Christine!!! 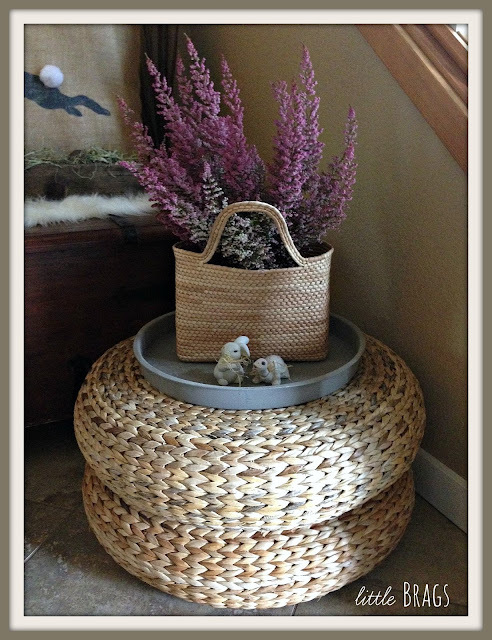 I love the baskets on the wall and the heather plant most of all. I like to decorate with nature too, and using hay instead of fake grass is a great idea!!! Happy Easter!!! Und süsses Kissen, voll gut!!! Your entry looks fantastic! Pinned and shared. Thanks for sharing at Merry Monday, hope to see you again next week! I love it! (Found you on Tatertots and Jello) Happy Good Friday! Love your Easter entry!! So cute!! You can keep it out longer than tomorrow you know, because it's so cute!! :) Happy Easter and thanks for sharing at Thursday Favorite Things Blog Hop! I'm in love with your fun little bunny pillow. That Easter bunny pillow is too fun! I'm pinning it for next year. Happy Easter and Thank you for sharing at the Celebrate Your Story Link Up Party. We are happy to inform you that this is featured at our Monday Cooking and Crafting with J&J. We hope to see you again! Enjoy the week. I love this entry! It's so pretty and welcoming. And that bunny pillow is the cutest! Definitely need to get myself a Cricut. Pinned! Thanks for sharing at Inspiration Thursday. 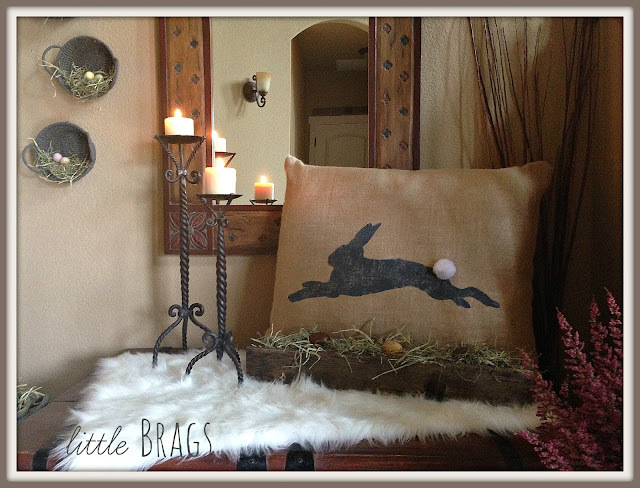 I love everything about your Easter entry, and that pillow is adorable! You're the featured blogger this week at Talk of the Town - thanks for linking up, and we look forward to seeing what you have to share this week! Love LOVE!!! This entryway is so beautiful and I adore the curated feel of it. Especially love the trunk! 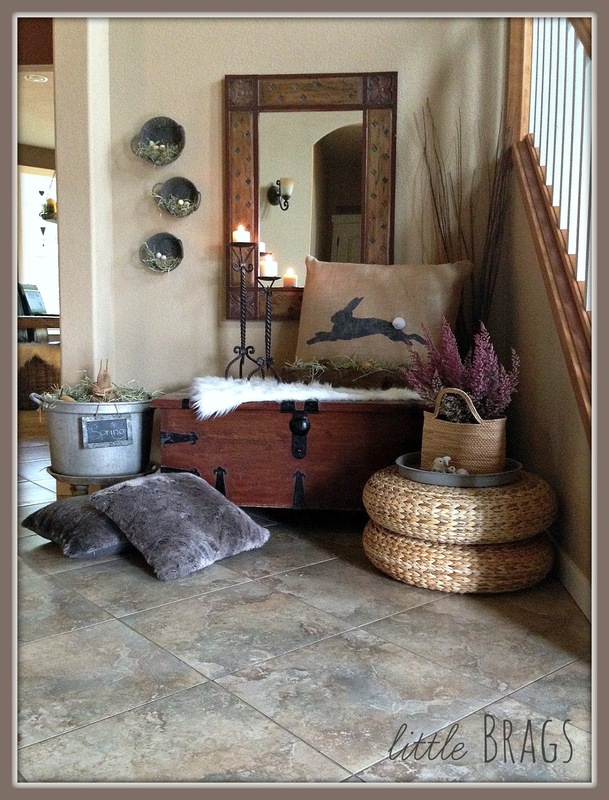 Thanks for sharing at the Your Home Decor and More Link Party!! Pinning and sharing.